DOD: September 02 1935, Flemington. mentions George Bragge as "Ocey" Bragg. Blueseum has been fortunate to have received some information from George Bragge's great grandchildren. George Henry Bragge (the grandson of two convicts) was born December 01 1860 at Pleasant Creek, now known as Stawell in Victoria. His parents John and Jane were involved in farming and gold mining. The family moved to Walhalla, then to Melbourne, where they settled at 161 Lygon Street Carlton. George became a cabinetmaker, working with his oldest brother William. George's son, George James followed him in his trade. The Bragge family story which was written in 1972 says that for nearly 100 years the family had a connection with the Carlton Football Club. George Bragge married his wife Amelia in May 1885 while he was playing with Norwood in Adelaide. A few months later he returned to Melbourne and resumed his playing career with Carlton on August 29. He passed away at Flemington, Victoria, on September 02 1935, aged 74. The Bragge family has also provided further information in regards to the Carlton team photo taken in Adelaide which is featured on the 1881 page. They have kindly sent Blueseum a copy of this photograph with the names of each player. Blueseum had the names of the players who went on the tour, and the photo, but now we can finally put the names to the faces! Photos or sketches of Carlton footballers, officials, etc. from the Pre VFL era are very rare. The Weekly Times reported that Carlton had recruited Bragge from its junior club. George Bragge probably made his debut for Carlton, aged 19 and 5 months, in the match against the Star of Carlton on Princes Oval. He was named in the Carlton squad of 20 published in the newspapers. Carlton won the match in which Blues' champion George Coulthard kicked all five goals to the Star's one. 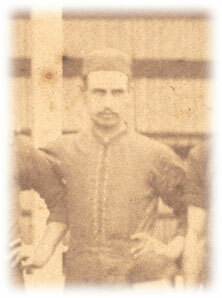 1880 New recruit from Carlton Juniors and one of the best Carlton men for the 1880 season. 1880 His first season. A determined and splendid little wing player. Kicks well either foot. George Bragge is pictured in the Carlton team photo taken in Adelaide on the club's tour of the city. See 1881 page for photo. 1881 Has also played occasionally. Played with Norwood F. C. in South Australia 1881-1885. Norwood and South Adelaide played on the Adelaide Oval. "Bragge, back, although heavily handicapped by his everyday clothes played his "Carlton" game, and frequently "came down like a wolf on the fold," proving simply invaluable." George was playing for Norwood against South Adelaide. Carlton played Melbourne on the Friendly Societies' ground. "Bragge, a noted Carlton player, who had been in Adelaide for some time, was included in the team, and his appearance on the ground was greeted with a cheer." George Bragge scored the first and third goals for Carlton. He was named among the Blues' best players in the 5.8 - 2.9 victory. 1886. (backs) singled out for special mention for the season. 1887 CFC Annual Report, G. Bragge scored 1 goal for the season. 1887 George Bragge was presented at the Carlton general meeting with an illuminated address for giving the club long service in the First Twenty; Friday 1st. April 1887. G. Bragge played with former Carlton players A. E. 'Topsy' Waldron, Billy Dedman, Alf McMichael, W. 'Billy' Bracken, Loch J. Bracken at Norwood, South Australia. 1934 At a past players get-together at half time during the Carlton vs Fitzroy match September 01 1934, George Bragge proudly boasted that he was never free kicked during his career at Carlton. George Bragges's funeral left his residence 82 Shield Street Flemington at 3.30pm for the Fawkner Cemetery. Page last modified on Tuesday 08 of May, 2018 00:31:53 AEST by blueycarlton. 1994 - Rhino's Report on Earl Spalding & Justin Madden (20/04/94).